I wanted to cook loads of comfort food because of the winter weather. I wanted meatloaf, chilli, sloppy joe, beef stew...But on the other hand, I wanted to cook something healthy before stuffing our face with food during the holiday seasons. Because of this dilemma, I have been struggling to find cooking inspirations. 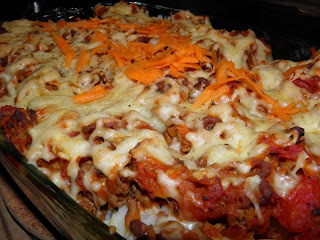 So I made this casserole tonight - the tomato-y meat sauce and cheese topping satisfied (some of) my crave for comfort food, and the cauliflower and carrot helped to make the dish (a bit) healthier. 2. Cook the potatoes in boiling water for about 15 minutes. Drain and set aside. 3. Cook the cauliflower in boiling water for about 10 minutes. Drain and set aside. 4. In a large pan, brown the beef in 1 tbsp of olive oil. Add the onion and carrots, and cook for about 5 minutes. Add the basil, tomato puree, tomato blocks, and vegetable stock. Bring to the boil, and simmer for about 15 minutes with a lid on. Remove from heat and set aside. 5. In a large casserole dish, throw in the potatoes and cauliflower. Cover with the meat sauce and grated cheese. Bake in the oven for 20 minutes. 6. Remove from the oven. Garnish with some shredded carrots and serve.